I have been blogging my heart out and then things have quieted down and so did the blog…I needed a little time to catch my breath and fix a few techno glitches. 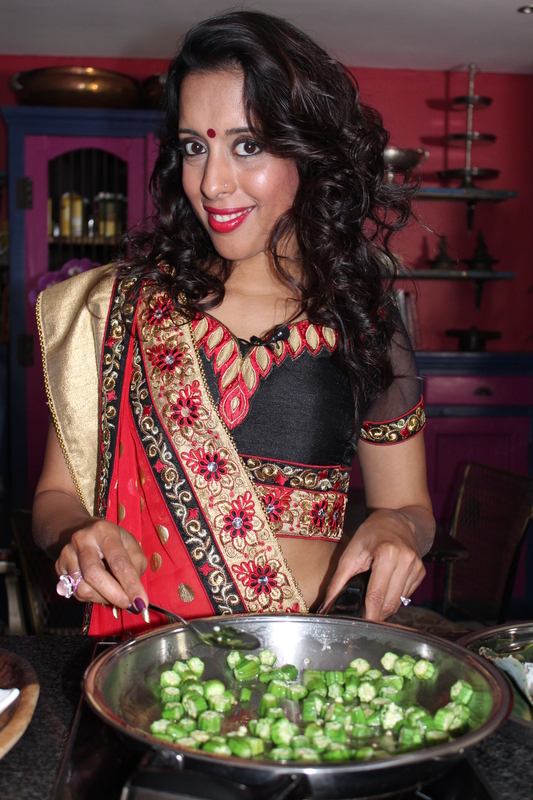 To end this crazy busy spell, I have just completed a whole new series of ‘Food Mela’ – I was absolutely delighted to be cooking on the show! I haven’t blogged for a while and was quite surprised after receiving messages from my blog friends requesting my return to the blogosphere! Heartwarming is the best word to describe it! 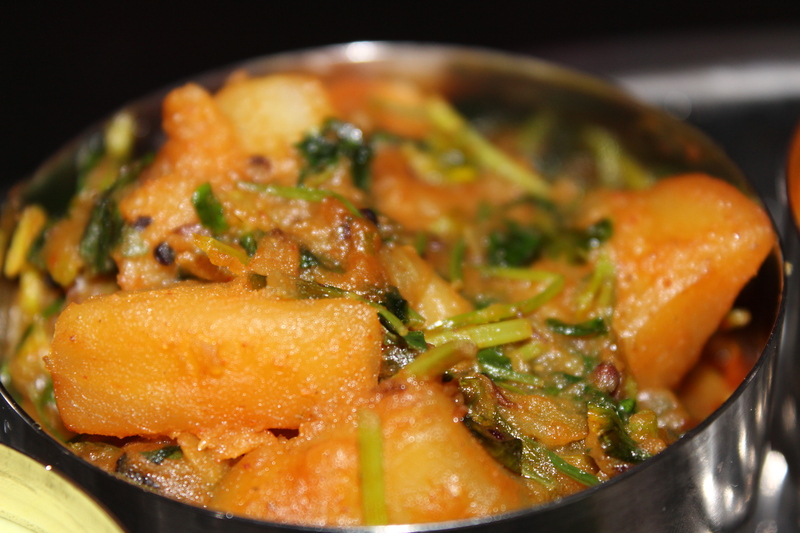 On the Mela menu, was Potato Curry with Methi and Tempered Okra – Gandhi’s favourites! Potato Curry is one of those stock standard favourites in any Indian home and I love a little leftover potato smushed into fresh bread almost like a potato buttie! Paired with a cup of good coffee, it’s the best hangover treatment…not that I get hangovers! The potato is simple enough to make – just remember to use Up to date potatoes for this recipe….they are available in Fruit and Veg City and in Indian Green Grocers! These potatoes have a floury texture like the English Maris Piper and King Edwards – they work like a charm! Here are a few tips to getting the okra right! Firstly, always slice the okra and leave it to dry out for a while to get rid of the sticky gooey liquid. Add salt after the okra is cooked…salt draws out the moisture from the okra and will turn your dish into a sticky mess…if you are cooking up a large amount of okra, fry them off in batches to prevent them from stewing….and for heaven’s sake, use a really good pan or skillet like the AMC 28cm Chef’s pan to fry off the okra….if you have a ‘crack pot’, the okra will stew! With an AMC pan, the solid base heats up evenly and retains the temperature! Now, on with the recipe! Heat oil in a 30cm AMC pot and add the mustard seeds. When they begin to splutter, add the cumin seeds. Fry until the cumin seeds turn a shade darker. Add the chopped onion, then the salt and saute until light golden brown. Add the cubed potatoes, then pour in boiled water – I add a little at a time so that the potatoes don’t turn mushy….potatoes can be pretty unpredictable! Lower the heat and simmer until the potatoes are tender. 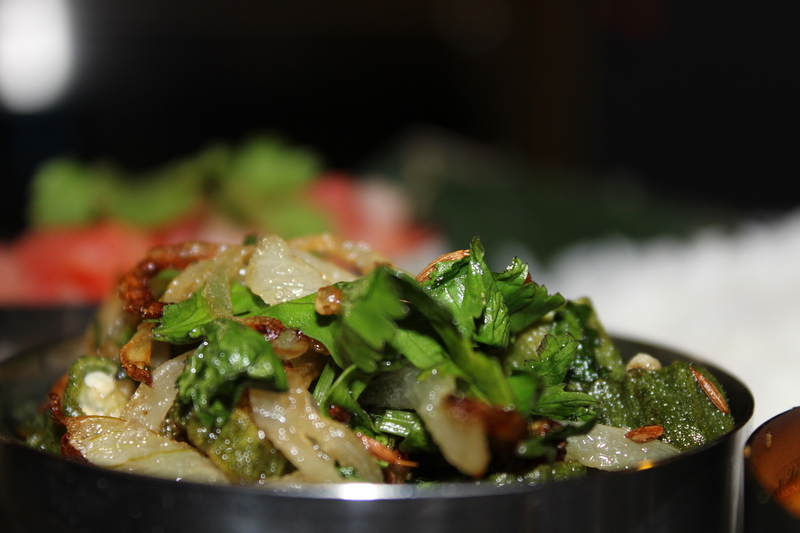 Sprinkle the fresh methi over and simmer for a minute or two until the methi wilts. Lightly rinse the okra and wipe dry with absorbent paper towel. 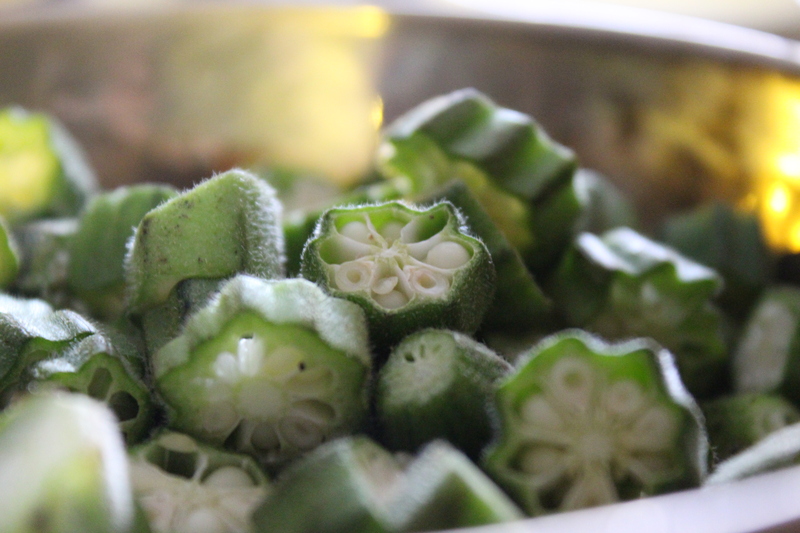 Slice the okra into rings and leave to dry for an hour. Heat the sunflower oil in an AMC Chef’s skillet. Add the okra and fry until light golden brown. Remove the okra from the pan and reheat the oil. Add the onion and fry until light golden brown. Add the okra and green chilli. Toss the okra lightly and add salt. Add the chopped coriander and stir lightly.